Look for these signs to guide you through the bike detour. 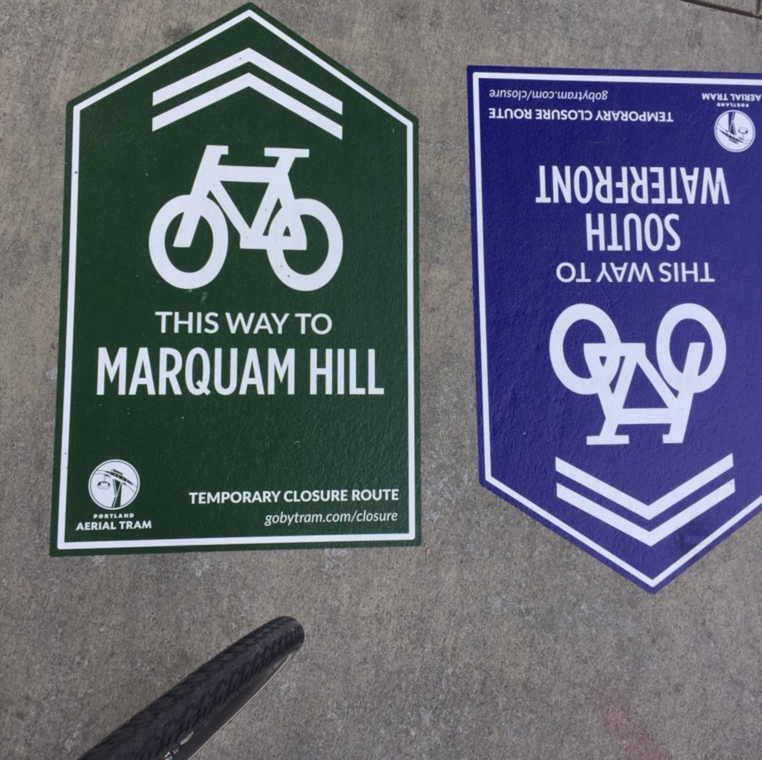 If you are one of the 2,500 or so OHSU employees who bike to campus and use the Portland Aerial Tram to get that free lift up to Marquam Hill, remember that you’ll have to change your plans for the next five weeks. As we shared last fall, a routine maintenance project will close the tram tomorrow through the end of next month (July 30th). The bad news is that people will have to figure out other ways to get up the hill — none of which will be as easy or convenient. But the good news is that the Portland Aerial Tram, OHSU and other agencies are pulling out all the stops to make sure things go as smoothly as possible during the closure. 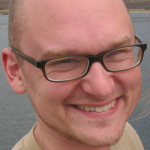 The GoByTram.com website has all the information you need to plan your trip by transit, biking, or walking. There’s even a frequent daily shuttle service they’ve set up just for the closure. The circuitous shuttle route will take 30 minutes. The tram route (lower middle, in grey) takes just four minutes. The Tram reflected in an OHSU building as seen from the Go By Bike valet lot. The Portland Aerial Tram will close for track maintenance from June 23rd through July 30th, 2018. That’s 38 days where you’ll have to find a different way up the hill. 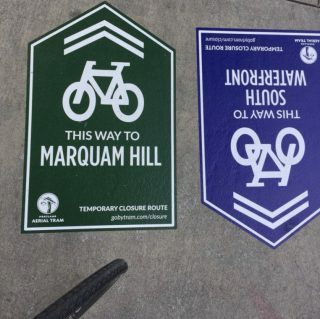 If you need or want to bike up to Marquam Hill for the campus and facilities of Oregon Health & Science University (OHSU), your ride will go from 180 seconds to about 30 minutes. Or maybe not (keep reading). 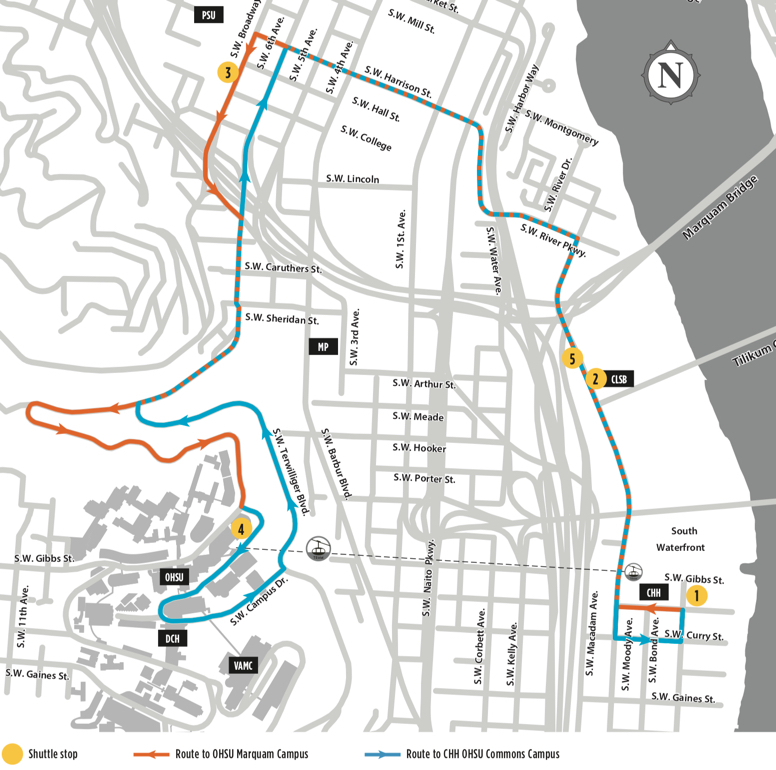 The Tram is a crucial link between South Waterfront and Marquam Hill for 7,000 daily commuters. OHSU data shows that of the 10,000 employees who work on the hill, about one-fourth of those who take the tram use a bike to get to campus. 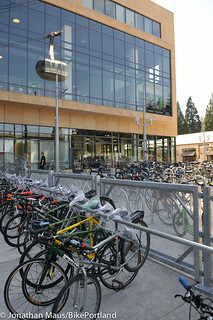 The Go By Bike valet at the base of the Tram averages over 328 bikes in its parking lot every day. A section of paved path built adjacent to the (in-progress) Tesla showroom on the Willamette River with South Waterfront’s residential towers in the background. When Tesla Motors revealed plans for a showroom in Portland last May we feared the worst. 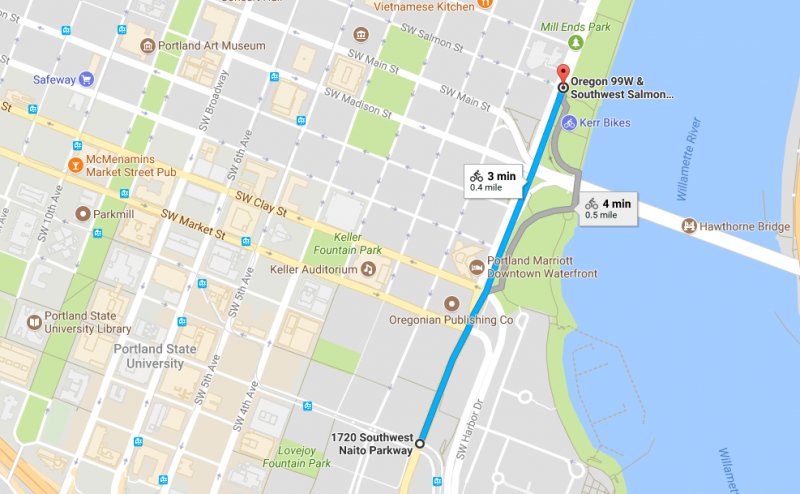 The location of the showroom (4330 SW Macadam Avenue) on the west side of the Willamette River just south of Portland’s burgeoning South Waterfront district, was smack-dab in the middle of an annoying gap in a key multi-use path. 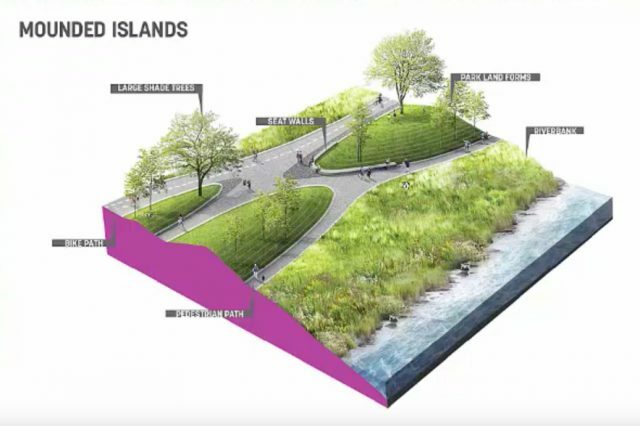 Artist’s rendition of how biking and walking paths could intersect with a public plaza on the Willamette riverfront as part of the South Waterfront Greenway’s North Reach. The City of Portland is in the latter stages of a master plan update process that will decide the fate of the northernmost section of the South Waterfront Greenway path. Last week Portland Parks & Recreation released three of the design concepts in a presentation given by project consultants and now they want to hear your feedback. 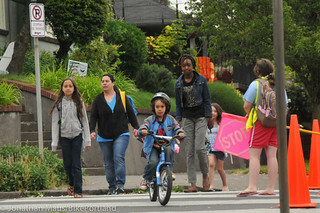 About a quarter of the grants went to Safe Routes to School programs. Here’s some good news: Metro just announced grants to 17 agencies and organizations throughout the region that will make it easier to get around without driving alone. The grants are worth a total of $2.5 million — money that comes from the federal government and is doled out by Metro via their Regional Travel Options (RTO) program. On that note, a $178,000 grant to the Community Cycling Center will allow the nonprofit to implement a “community centered” Safe Routes to School program at Title I schools (where students come from low-income families). And the Bicycle Transportation Alliance won $203,000 for an “Access to Bicycling initiative” that will include a continuation of their Women Bike program and hands-on bike repair and riding clinics at workplaces and in communities around the region. In Washington County, the Westside Transportation Alliance will use its $196,000 grant to encourage biking, walking and transit use in areas with a high percentage of low-wage and shift workers. 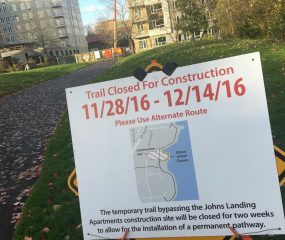 Willamette Greenway path closure through December 14th. 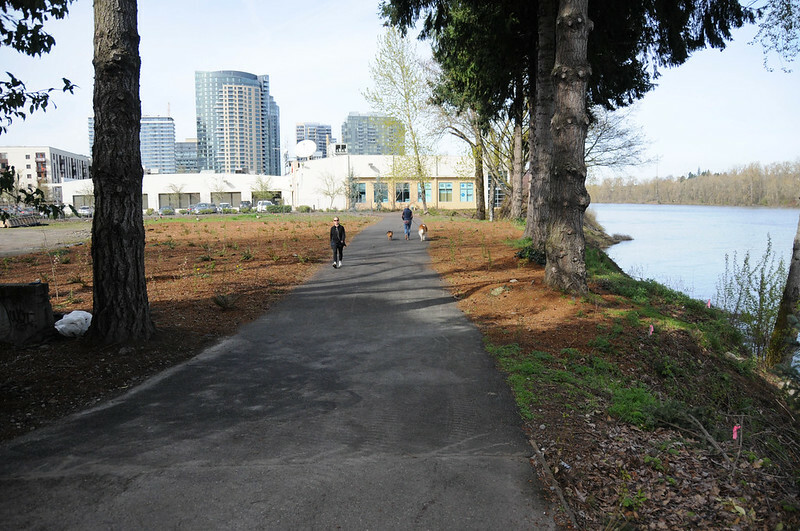 A construction project on the west side of the Willamette River just south of the South Waterfront district has closed the Greenway path and the City of Portland has offered no official detour. Crews from Fore Construction are building the Sanctuary Apartments at 4800 SW Landing Drive. 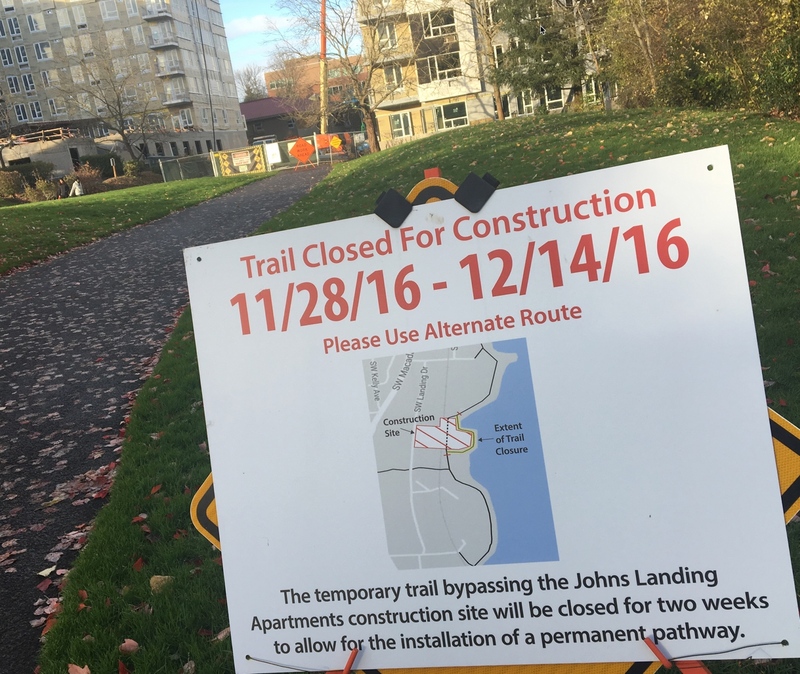 A notice distributed by the company last week said work on the apartments will include the rebuilding and resurfacing of the Willamette Greenway path and the path will be closed through December 14th. Fore’s statement said, “We will endeavor to keep as much of the trail open as possible during this period.” There was no specific timeline for when the path would be fully closed or open during construction and no detour map was provided with the company statement. We asked Fore and the Portland Parks & Recreation bureau what bicycle riders should do when the path is closed.